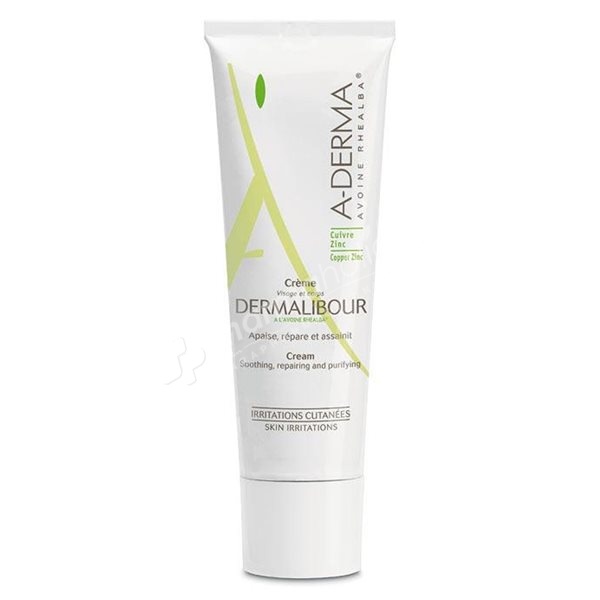 Aderma Dermalibour Cream soothes and purifies the skin and helps repair the epidermis. Aderma Dermalibour Cream is recommended for iterative dermatitis. Aderma Dermalibour Cream is softening, anti-microbe, regenerating, emollient and protective. Aderma Dermalibour Cream alleviates irritations of the skin, cleanses it and supports its repair thanks to the association of total extract of Oats Rhealba (anti-irritant, softening) and active ingredients known for their alleviating, antimicrobic and regenerating properties. Apply Dermalibour twice to 3 times per day to the zone to be treated. For face & body. Adults, children and infants. Aqua, Mineral Oil (Paraffinum Liquidum), Caprylic / Capric Triglyceride, Glycerin, Hydrogenated Vegetable Oil, Zinc Oxide, PEG-30 Dipolyhydroxystearate, Propylene Glycol, Avena Sativa (Oat) Kernel Flour (Avena Sativa Flour), PEG-22 / Dodecyl Glycol Copolymer, Avena Sativa (Oat) Kernel Oil (Avena Sativa Kernel Oil), Copper Sulfate, Magnesium Sulfate, Zinc Sulfate.